Play with your dog … It’s important! Playing with your dog will build the relationship between you. It will use his mind in order to enable him to settle when you need him to, and an enthusiastic game will certainly be fun for both of you. The home that hosts multi dogs automatically provides stimulation for the animals by allowing interaction with each other. Single dogs benefit greatly from the interaction and stimulation they get when you play with your dog. Play is beneficial to you as an owner too. Tug of war with a delighted and enthusiastic Staffordshire bull terrier on the other end of a tatty rope toy really is a great way to let off some steam after a hard day. The enthusiasm of an excited dog is infectious. They are in their element whilst being given individual attention and their happiness spreads. Any owner that walks through the door after a bad day to be met by a loyal and overjoyed canine companion cannot fail to appreciate the shift in mood that their dog provides. Play is a great way to instill general control and training into your dog. Dog training games involving commands such as wait, sit and leave can all be taught when playing with a toy. Your dog is likely to learn well when the lesson is based in play. Happiness and positivity encourage thorough learning. This happy and eager state of mind is what clicker training and other positive reinforcement techniques are based upon. There are many ways that you can play with your dog. Certain breeds enjoy games that are catered to their instinct. An example of instinct based play is a Labrador that retrieves the ball, endlessly asking for just one more throw. The springer spaniel bred for sniffing out game birds in bushy areas will really enjoy interaction based around searching for her toy. Playing with your dog is great. Whether you are throwing a ball, pulling on a toy, teaching him to jump into your arms or simply playing chase you will both thoroughly enjoy yourselves. There is no room to be self-conscious when you play with your dog. Canine games are great for stress relief. Play ball. This is great for dogs that sniff around and use their noses a lot. Enhance a normal game of fetch by introducing some techniques often used when training search dogs. Hide the ball somewhere where the dog has to work by sniffing to find it. Then guide him into the area watching him follow his excellent sense of smell until he finds the toy. You can play this inside or out. By shutting your dog outside a room you can go in with the ball and hide it. When you let him into the room he will search until he finds his toy. Vary things by placing the toy at different heights and touching a lot of the room on the way around. You will be creating disturbance for him to sniff at. Scatter feeding is great for a hungry dog. Throw treats or his dried food around and he will become very excited wondering where the next sweetie will land. You can ask things of him when doing this, practice control like sit or down before throwing the treat. 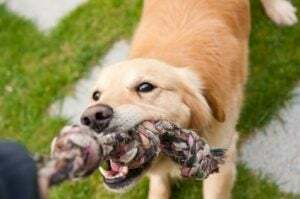 Tug of war is another good game to play, a couple of rope toys and some treats and you can have a grand old time. Practice control by regularly offering either a treat or the other toy as a bartering tool. Your dog should easily let go when you are offering a swap. If he doesn’t just stop playing and this will let him know that he must swap or the game ends. Let him win the toy sometimes too, it will increase his confidence and keep him interested. Activity toys are great to encourage a dog to play alone when you are busy. A ball or similar that can be stuffed with treats is a wonderful occupier for a food loving dog. An activity ball will be bashed around merrily until empty so probably best used outside or when the dog is alone. If you are feeling stressed or just a little sad, play with your dog for a few minutes and it will put an entire new slant on the day. Dog Aggression Training, Understanding Your Dog. A dog that shows signs of aggression can become a problem within a family environment; therefore any dog owner should have a basic understanding of why and how a dog can become aggressive. 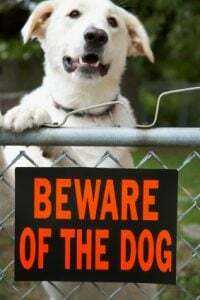 If your dog has suddenly developed aggressive behavior it is paramount that he is checked by a Veterinarian to rule out any physical reason for his behavior change. If a fearful dog feels threatened and unable to remove himself from the threat then he may resort to aggression as a defensive behavior. This can progress, over time, to the point of an aggressive reaction before the perceived threat is even apparent to the human eye. A dog who has learned that aggression provides the result he would like may resort to a threatening growl or bark purely as a learned behavior. An example of this is food or resource guarding. Although guarding behavior this can also be based in fear, the fear of losing a needed resource. The behavior of any dog will respond to the circumstance he is in. Different dog breeds have differing levels of reaction. Some breeds will not resort to aggressive stance or behavior until the absolute last resort whereas others will seem to become aggressive immediately on contact with a trigger circumstance. Successful dog aggression training will modify the dog’s immediate response to the trigger. The early signs of aggression can easily be missed by an unaware owner. This is usually what happens when a dog is reported to have bitten with no warning. 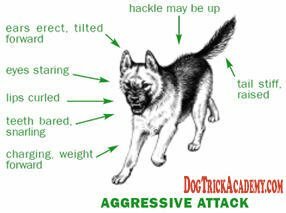 The following points are progressive and generic signs that an aggressive response is building within your dog. Calming signals may prelude this behavior which would include yawning, glancing away and attempting to leave the situation. This depends on how reliant on aggression the dog is to produce a result. Somewhere between posturing and biting the dog may show a slight freeze. This moment of being completely still is the dog’s natural fight or flight reaction. If the freeze is displayed and the dog cannot leave the situation he is likely to feel that he needs to bite next. Aggressive behavior displayed by your dog is almost always a response to a stimulant. Before commencing any type of dog aggression training it is vital to first recognize the dogs behavior and the external trigger that leads to it. A trigger for aggressive behavior in a dog can be anything at all. It will depend on previous experiences and is usually based in fear or uncertainty. Some of the more common triggers and their possible learning processes are listed below. Dog aggression – Fear caused by under socialization or previous attack. People aggression- Fear caused by lack of social contact, often with children. Fear aggression with people can also be a result of abuse. Guarding behavior – Resource guarding, this can be learned. Or a response to past hunger or struggling for food, comfort or attention. Territorial aggression – Guarding the home, once again often learned. The excitement or fear response of visitors to the home can easily become reinforced. Certain breeds will as a natural response guard the home more than others. If your dog is showing aggressive behavior, it is vital that by using positive and reward based conditioning that this behavior is changed. To modify any behavior type you will need to go deep into the roots of the problem, know exactly why the behavior is manifesting and treat the cause and not the symptoms, which in this case is the aggressive behavior. Never confront a dog that is showing aggressive behavior. It is essential that the dog is not forced to carry out the behavior that he is threatening. A behavior modification process for aggression will usually follow the stages below. Each dog will need slightly different handling depending on many factors including the dogs past, breed type and nature. Observation – Watching the dog before he resorts to aggression. Noting the point of change in his body language. Modification – When observation is carried out a dog’s limits can be identified. For example aggression directed at another dog may only be displayed towards a dog within a range of a few meters. If this is the case modification can begin by working on keeping the dog relaxed whilst getting closer gradually to another dog. This can be done by rewarding calm behavior and increasing distance if aggressive behavior appears to be developing. If carrying out dog aggression training is likely to put you, your dog or anyone else at risk it is imperative that you seek professional one on one advice from an established dog behaviorist or reputable positive dog trainer. Taking your dog for a walk on a leash shouldn’t mean that your dog is pulling you down the block! Proper leash training will make walking your dog on a day-to-day basis a pleasant experience. As your dog learns how to walk obediently on a leash, he will remain by your side at all times without any tension or pulling. Before leash training even begins, teach your dog to remain calm when you put his leash on. Many dogs will get excited the second that they see their leash because they know that they are going to go outside on a walk. Command your dog to sit and stay quietly when you put on the leash so that he becomes obedient to you before beginning a walk. If your dog begins to jump and react to the leash, wait to begin the walk until he sits down calmly for at least a minute. Most dogs learn how to quickly master the “sit” command. When you use this command as a requirement for starting a walk, your dog will understand that he must obey if he wants to go out on the leash. You can practice leash training at home first of all to teach your dog good behavior on a leash. Attach the leash to your dog’s collar and stand still while holding the leash next to your body. Your dog may start jumping with excitement, but when you stand still, your dog will start to calm down. As soon as your dog calms down, give him a treat and praise to reinforce the good behavior. When your dog sits or stands at your side for a moment without jumping, reward and say “go” while taking a step forward. After you take the first step, stand still again. If your dog begins to jump or get excited, wait for him to stand still until you continue. Once he stands still, praise and reward with a treat. Repeat this behavior several times until your dog learns to calm down each time that you take a step forward. If your dog is new to leash training or is a puppy, his most common instinct is to pull at the leash. If your dog is pulling on the leash, do not walk, instead go in the other direction. As soon as your dog responds to you and begins walking without pulling on the leash, praise him and give him a treat for his good behavior. This positive reinforcement will show your dog the correct way to walk on a leash; because of the reward, he will be likely to repeat his good behavior again and again. Do not continue walking if your dog is pulling ahead. This will only reward your dog for negative behavior. Stop walking immediately when your dog is pulling and wait for him to calm down next to you before you continue. You can also go the other direction, I recommend that you train in a park in the beginning as it allows you to go in any direction. Remember to reward with a treat for good behavior. Do not pull on your dog when he is on the leash. This will cause your dog to pull even harder. Do not use a retractable leash for better control. The problem with retractable leashes is that they always pull on the dog even if he is walking nicely, so it makes it impossible to train a dog to not pull. If your dog is new to leash training, patience is the best tool to have on your side. Any time that your dog pulls or runs ahead, he must understand that his behavior is unacceptable. You must stop in your tracks or turn in the other direction until your dog corrects his bad behavior. Once your dog calms down and walks by your side, he can be rewarded with a treat to positively reinforce the action. When walking on a leash, it’s you – not your dog – who is the leader! Nonstop dog barking is enough to drive any pet owner insane. 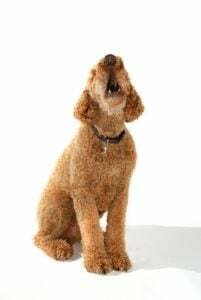 If you’re at the end of your rope and can’t seem to stop your dog from barking any time that he meets a new person or that the doorbell rings, it may be time to consider how to stop dog barking using technology. For dogs that do not respond well to basic positive reinforcement training to stop dog barking, several devices can be used to capture the attention of a dog and discourage him from barking when he is surprised or afraid. Scent Collar: A simple and humane gadget used to stop dog barking is a scent collar. Often called an anti-bark spray collar, a scent collar is relatively inexpensive at less than $50 and will release a harmless, scentless spray every time that your dog barks. The spray is citronella scented and guaranteed 100% safe for all breeds of dogs and puppies. The purpose of this device to stop dog barking is that each time the collar releases the spray in front of the snout of the dog, the dog will become distracted and stop barking. He will soon learn to expect this distraction each time he barks; this will cause him to quit barking excessively in order to avoid spray in his face. This is a beneficial gadget to use to stop dog barking since it will not cause pain, fear, or any side effects when training your dog. High Frequency Device: Another popular gadget to stop dog barking is an electronic device that emits high-pitched frequencies. This is a powerful and effective way to train to stop dog barking without using crueler methods of shocks or pulses in a collar. The device is equipped with a high-power speaker that can cover a 60 foot radius. It is compatible with any size or breed of dog. When the dog barks at a stranger or at the doorbell, the device will emit an ultrasonic sound that only a dog can hear. The dog will soon learn to associate this high-pitched frequency with barking and automatically stop. Ideally, this device should be used to stop dog barking in a home with multiple dogs that are difficult to control. If you have one dog that is a constant barker and that excites the other dogs whenever you have a guest, this high-frequency device can be used at home to humanely control and train multiple dogs at one time. Training Tone Collar: Another effective and humane way to stop dog barking at home is with a training tone collar. To clarify, this device is not a shock collar, which should not be used as a method to stop dog barking at home since it will instill fear in your pet. This training tone collar produces three positive training tones that are activated through the collar. As the pet owner, you can associate the tones with positive commands like “sit”, “fetch”, and “heel”. The negative tones on the collar can be used to encourage your dog to stop unpleasant behaviors, like barking, chewing, or digging. This electronic training system is a method that can be used to get the attention of your dog to stop barking and provide positive reinforcement when he learns a new, good behavior. As a word of caution, many training tone collars are also equipped with electric shocks. Take the time to purchase a training tone collar that does not have an electrical shock; it is not recommended to train your dog using this harsh method of punishment. Last but not least, if you are struggling with neighboring dogs that bark constantly throughout the night or excite your dogs and cause them to bark in your yard, you can try a high-frequency device that is attached to a tree or fence post. When you talk to another person in day-to-day life, you pick up on hundreds of body language cues without even realizing it. But did you know that your dog gives off the same cues regarding their temperament, mood, and behavior by using their body language? When it comes to managing an aggressive dog, understanding body language is key. Assessing the body language of an aggressive dog can mean the difference between getting bitten and stopping a violent situation before it starts. Ears – Back or forward, pulled close to the head. Eyes – Narrow or staring. Mouth – Open lips, snarling teeth. Body – Tense, rigid, in a dominant position. Tail – Fur sticking up, tail sticking straight out. Behavior – Snarling, growling, barking. Some of the behavioral cues listed above are obvious, like snarling or growling. Other behavioral cues from an aggressive dog are more subtle, like narrow eyes and a rigid body position. There’s a dramatic difference between defensive aggression and an aggressive attack. If a dog feels like they’re in danger, they will exhibit a fight-or-flight response, similar to humans. An example would be if a dog is on a leash and becomes frightened by another dog. His natural instinct will be to flee, but he may be forced to go on defensive attack if he is held captive on a leash. Many people believe that a dog this situation is an aggressive dog, but this dog is actually fearful. This behavior is what is known as defensive aggression. Clearly, the body language between a defensive and an aggressive dog is quite different. A defensive dog is reacting out of his flight instinct; an aggressive dog is reacting out of his fight instinct. Whether a dog is defensive or aggressive, he may be prone to bite if he feels threatened or attacked. 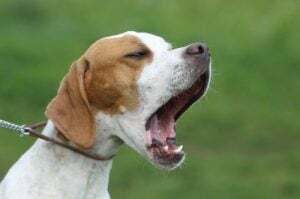 Understanding both of the behavioral cues listed above will make it easier to manage a situation if a dog is snarling and showing signs that it may bite. This again plays into the natural instinct of a dog to chase you, catch you, and bite you. Another fairly obvious tip to prevent a dog bite is to never disturb a dog when it is eating, sleeping, chewing on a toy, or caring for puppies. Do not scream or run away. Keep your hands at your sides, stay still, and avoid eye contact. Allow the dog to lose interest. Slowly back away from the dog. If the dog lunges to bite, throw a jacket, bag, bicycle, or another object in his path. If you are knocked to the ground, curl into the fetal position, place your hands over your ears, and stay still. Try to react as little as possible. If your dog is showing signs of aggression, the best thing that you can do to prevent him from biting or attacking is to socialize him. Find a trainer that works well with aggressive dogs in order to slowly condition your dog to accept new dogs and strangers. Additionally, if your dog has not been spayed or neutered, this could greatly reduce aggression and make it easier to socialize your dog in new situations. A routine procedure like neutering will make your dog less likely to fight with other dogs and bite strangers. Make no mistake – aggression is a serious issue that needs to be addressed immediately. Avoiding or ignoring the behavioral signs listed above will only make the problem worse and could endanger those around you. “How to Avoid a Dog Bite: The Humane Society of the United States.” The Humane Society of the United States: The Humane Society of the United States. N.p., n.d. Web. 28 Nov. 2011. In nature, puppies have a so-called “puppy license” for the first 4 or 5 months. During this time, older dogs will let them get away with all sorts of puppy behavior without retaliation. If the older dog doesn’t feel like playing with the pup, then he will often just get up and move away, or else give a quick verbal signal that he isn’t interested. Only once this “puppy license” has expired do the pups start getting real lessons in manners from the other dogs. During her seminars, Patricia McConnell often shows two videos of Bailey, a beautiful golden retriever pup. In the first video, Bailey is perhaps 4 months old, and is chewing on a child’s stuffed toy. The woman owner tries to get the toy away from the dog by using outdated “dominance” techniques such as grabbing the puppy by the scruff of the neck and trying to make it submit to her. Retrievers are mouthy dogs and by their nature love to chew on stuff. So can anyone guess what happens after a month or two of such “training”? In the second video, Bailey is around 6 months old. Again the dog is chewing on a toy, except that now he’s quite a bit larger. He snarls as the owner tries to get the toy away, and snaps at her hand. The owner is still faithfully following her trainer’s orders and trying to get the dog to submit to her authority. So what happens next? Bailey was put down before he reached one year of age. It didn’t have to happen! The dog wasn’t aggressive by nature, but simply ruined by bad training and horrible conditioning. Unfortunately, some trainers today still rely on outdated and now proven false research going back to the 1920’s, 30’s and 40’s. The pack leader isn’t always the strongest. Many of you have perhaps seen and wondered how a household with several dogs, sometimes the bigger dogs will acknowledge a smaller and physically weaker dog as the pack leader? Surely that alone is enough to debunk the old-fashioned myths about the biggest bully always becoming the pack leader? 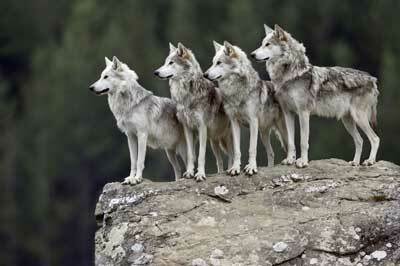 So, how do we dog owners become the pack leaders? Well, it isn’t so much a matter of forcing ourselves into the position as getting our dogs to accept us as such. Sounds much tougher than just pinning a dog to the floor in an alpha roll, doesn’t it? Well, yes, it requires a bit more work, and a bit more thought, and a bit more effort. Don’t let the dog walk first out through the door. Don’t let the dog eat its meal before you eat yours. Don’t let the dog be positioned higher up than you (physically, like you on the floor and the dog up on the couch). Don’t let the dog be in the bed or on the sofa. The dog should pee only to empty the bladder (don’t let the dog mark when taking a walk). Punish severely all protests, like growling and the like. Always be sure to win tug of war and other games you play with the dog. Don’t greet the dog when coming home. Initiates moving from the location. Leads the group to special places, like hunting grounds. Seldom initiates social activities, but does not turn away. Often is the subject of affection. Finds places to rest, and lies down, thereby making the group relax, too. Take goal directed walks that lead to interesting places. Choose types of activities (courses, mental training, etc). Give the dog a starting signal. Tell the dog in which order the activities shall be. Let the dog greet, but don’t initiate the greeting very often. Always respond with affection when the dog makes contact. Rest at certain times and thereby get the dog to relax, too. To summarize, becoming a pack leader in your dog’s eyes will require active involvement and daily training. Are you up for it? Dogs have learned throughout their many years of existence that they must protect their resources, such as food, in order to survive. They’ve learned that they could easily keep other dogs from eating their food by growling, showing teethes, snapping or even biting other dogs that came too close to their food. But dogs live a very different lifestyle since we’ve started to domesticate them. Some of their ingrained behaviors are not acceptable when living with people, such as dog food aggression. This could be very dangerous, especially when the dog begins to protect his food from his owner, or anyone who comes close to him. Some dog owners have the tendency of leaving unlimited amounts of food available for their dog. The dog can then eat whenever it wants, as much as it wants and is subject to no rules. There are a few reasons why I advise against doing this, mainly because the dog does not understand that you are the provider of the food, but also because it usually leads to the dog over-eating and becoming overweight. To prevent dog food aggression, it is always a good idea to give your dog measured meals and at regular intervals. If you look on the back of your dog food’s packaging, you will find a chart that indicates how much food your dog should eat, relative to his weight. 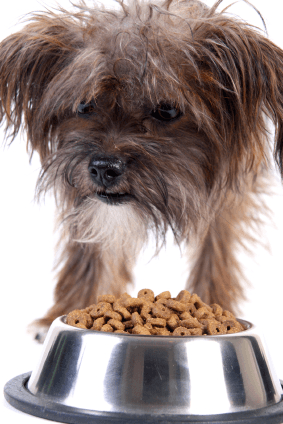 You should also give your dog more food than the maximum amount indicated if he is a very active dog. When feeding your dog, place his food bowl down, and give him a maximum of thirty minutes to eat, and then pick up the bowl and any remaining food. If your dog has already bitten someone while defending his food bowl, then you should immediately contact a reputable dog trainer or behaviorist. They will be able to access your dog’s behavior and to determine the safest way to proceed with his training. Training your dog to not guard his food bowl is best done while he is still a puppy. However adults and older dogs can also be trained, it will just take a little bit more time and dedication. The best way to get your dog to accept people around his food bowl is to teach him that wonderful things will happen when people are nearby when he is eating. Please follow the following instructions carefully, while making sure that your dog is comfortable with each step before moving onto the next. Give your dog half of his usual meal, when he finishes, pick up the empty bowl and add the second half, then give it back. Randomly walk up to your dog while he is eating and drop in super delicious dog treats in his food bowl. Walk up to your dog while talking calmly, and stoke and pet him lightly. Then drop in a super delicious dog treat into his food bowl. Take away your dog’s food bowl before he is finished, add some super delicious treats and give it back. Dog food aggression is one of the most dangerous and most common problematic behaviors encountered. Small children are especially at risk around food possessive dogs. If your dog training efforts do not work or show progress, please call a reputable dog trainer or behaviorist as soon as possible. It is truly amazing to see that all dogs from all over the world has learned to communicate with each other using a universal dog body language. Whether you are from China, Europe or Mexico, all dogs communicate the same way. They communicate their moods and feelings by giving out signals with their body. An encounter with a dog can be a lovely experience or a very bad one and is totally depending on how well you interpret dog body language. 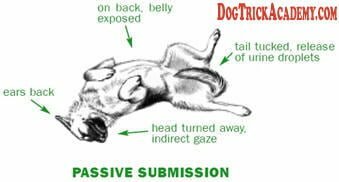 In this universal dog body language, postures and movements express mood, rank and intention. These are clearly understood by other dogs but they can be confusing to humans. For example, a dog that is wagging his tail does not necessarily mean that he is friendly. It could mean that he is afraid and hope that you don’t hurt him or it could mean that he is getting ready to confront you and might lunge and bite you if you get too close. To know what a dog is trying to communicate, you will have to look at the overall dog body language. He will be giving multiple messages through his facial expression, his tail and the way he is standing. Some breeds make it easier to recognize the dog’s body language. Dogs that have long and curly tails with pointy ears will be much easier to recognize than a dog with cropped ears or a docked tail. 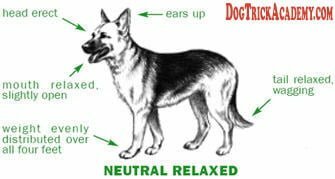 Neutral State: A dog which is in a happy emotional state will be less tense than when he is in an alert or aggressive state. His tail is relaxed and wagging; his mouth is slightly open, which might look like a smile to us. His breathing is slightly energetic depending on how happy he is. The facial muscles and the ears are relaxed. If he is very excited he may jump, bow, growl or bark. 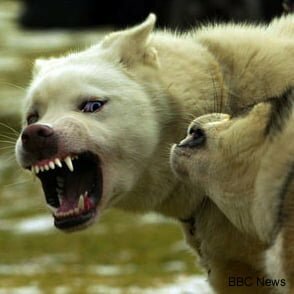 But the playful growls and barks are given at a much higher pitch than the ones indicating aggression. Submissive: In the universal dog body language, when a dog is frightened, he will try to make himself look as small as possible. They will draw back from anything confronting them, and they may even crouch on the floor. They will avoid any direct eye contact. In general, the tail is down or between the legs; they may lick their lips or nose in a nervous manner. As an extreme they might even roll onto their side or on their back to show their belly or even urinate. Aroused: An alert dog will have tense muscles, ears will be forward and the face will have wrinkles. His tail may be out straight and wagging slowly from side to side. It’s very important to understand that a dog may become aggressive quickly, or he might just be wondering who is approaching or what that weird noise was. Either way, it’s very important to approach an alert dog with caution. 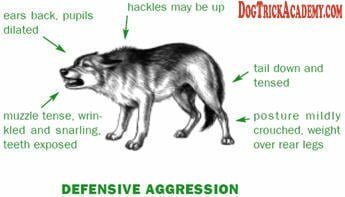 Defensive Aggression: When a dog is in a situation where he believes he might be in danger, he has two options; he can either fight or flee. When a frightened dog is approached by another dog, his natural instinct is to run away. But if he is on a leash, he isn’t able to run away and he becomes more fearful, and it usually results in the dog attacking the approaching dog. To the untrained eye, this might look like the dog is very aggressive towards other dogs, but he is actually afraid of the other dog and wasn’t able to back away. We call this fear-aggressive. Aggressive Attack: On the other hand, the aggressive dog is much more likely to exhibit the fight instinct. Aggressive dogs will do everything to make themselves look bigger. They lean forward on their toes, they bare their teeth and their body and face stiffen, exhibiting very deep facial wrinkles. The ears move forward and the tail wags stiffly and slowly from side to side. And they stare directly at the threat. Overall, it is important to learn to understand dog body language so that you can respond accordingly to every situation. If your dog is being submissive, then get him to change what he is feeling by going for a walk or doing something to boost his confidence. If your dog is emitting strong defensive aggression then you need to warn others that are in the same environment of what is happening. Just doing that alone can prevent a dog from biting someone.